Happy Leap day! I think it’s important for people to have a “treat yo-self day”. Because you’re worth it. Hopefully. Sol Food Restaurant in San Rafael is where my friends and I go to treat our selves. It is pretty rare for us to go only because it’s pretty far from us. But this restaurant tops the charts for us: excellent Puerto Rican cuisine, great design/atmosphere, and an addicting homemade hot sauce. Their hot sauce is so popular it’s bottled and sold…pretty expensive though. Since we can’t go as often as we would like, Sean pushed me into making his favorite dish: Pollo Al Horno. I’ve made it before, but the red bean side dish is the difficult part that I couldn’t figure out until now. 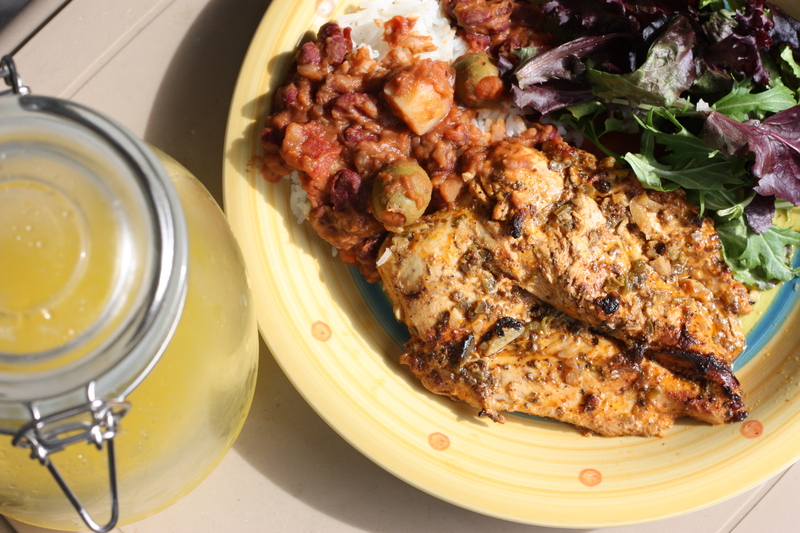 The dish depends on having both the chicken and beans. For the chicken, take chicken breasts and butterfly them. That means cut the breast horizontally in half, but stopping at the end so you can open it up (looks like a heart). There are plenty of videos online that can help explain. Season with salt and pepper. For the marinade, take a lot of garlic, I used about 5 cloves and chop them finely into a mixing bowl. Add about a 2 tablespoons of paprika, 1 teaspoon of cumin, 1.5 tablespoons of honey, 1 tablespoon apply cider vinegar, and the juice of 5 limes. Mix together, it should look reddish in color. As you mix, add in oil olive until the marinade is glossy (about the same amount of lime juice). I just realized this is almost a lime vinaigrette, if that helps. Then drop the chicken into the marinade and let sit in the fridge for about an hour, maybe 40 mins. In the mean time, let’s make the bean dish. You’ll need 1 can of red kidney beans, 1 jar of olives (the ones with pimentos), 1 clove of chopped garlic, quarter of an onion finely chopped, diced tomatoes (either canned or fresh, equal amount to beans), and 1 potato. Sweat the onions down with olive oil in a tall pot and then add garlic. After 30 seconds add tomatoes and stew for 1 minute. Then add the can of drained beans. I threw in a slash of apple cider vinegar here because I had it out. Throw in about half the jar of olives. Then add just enough water to have the water level just above what’s in the pot. Cover and bring to a boil and then lower to a simmer. The longer this stews, the better. We’re waiting for the chicken so, we have time. Stir occasionally. Fast forward about an hour and turn your broiler on high with a rack in the middle. Line a baking pan (with high sides) that has enough room to lay the chicken flat with foil. Put the chicken and the marinade in the baking pan and broil for about 20-30 minutes, basically until done. Keep a watchful eye though, it can burn easily. I like the charred taste that you can get from the broiler, but it can get out of hand. I did not need to flip it surprisingly, it was cooked all the way through. I basted the chicken during the final minutes. Plate the chicken with a side of those beans and rice, and you have something really special here. Sean also wanted to make limeade, because he always gets it at the restaurant. I’ll show you how to make that next time! I don’t know how to make their hot sauce, but I’ll try one day. So if you can’t make it out to Sol Food, this is definitely going to keep you happy. And remember, it’s Leap Day, real life is for March! This entry was posted on February 29, 2012 by rrfoods in Chicken, Dinner and tagged Leap Day, Pollo Al Horno, Puerto Rican, Sol Food.